Live! 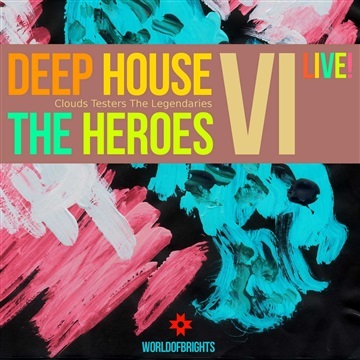 with amazing music of WorldOfBrights / Clouds Testers The Legendaries labels, compiled in the sixth volume of "Deep House The Heroes Vol. VI: Live!" compilation - more than 80 impressive Deep House and Nu-Disco compositions by musicians from Russia, Ukraine, Kazakhstan, Belgium, Turkey and Argentina, including the long-liver of the national house-chart - "London Awaits" by Digital Kiss, al l bo & Spill. Just download the original tracks and official remixes by al l bo, Arne Woutersax, Artful Fox, Black Mafia DJ, Charodey, Clouds Testers, Digital Kiss, DIMTA, DJ Andry IG, DJ E Harmor, Edvig, Ess Kimo, Francesco Kaino, Mike Cox, Mikhail Tretyakov, Nikita Varlamov, Petr, Sairtech, soundsperale, Spill, TRN, The Soap Opera, Yaroslav Like Planet & Yeckah to get the musical energy of Live!